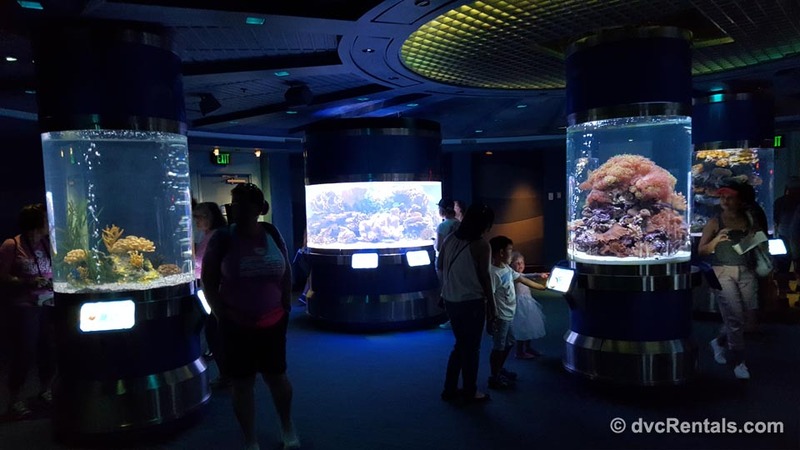 While most guests to Future World at Epcot experience the attraction The Seas with Nemo and Friends, and many (especially those with little ones in tow) enjoy Turtle Talk with Crush, there is so much more in the Living Seas pavilion that the majority of people rush right past. In their hurry to get to the next “big thing” aka another ride, they miss some really cool things in the Living Seas. There’s nothing wrong with wanting to do all the rides, but sometimes it’s nice to slow down a bit. This pavilion is a fun, air conditioned, beautiful place to do so, especially if you have small children with you (but it applies to adults as well!). 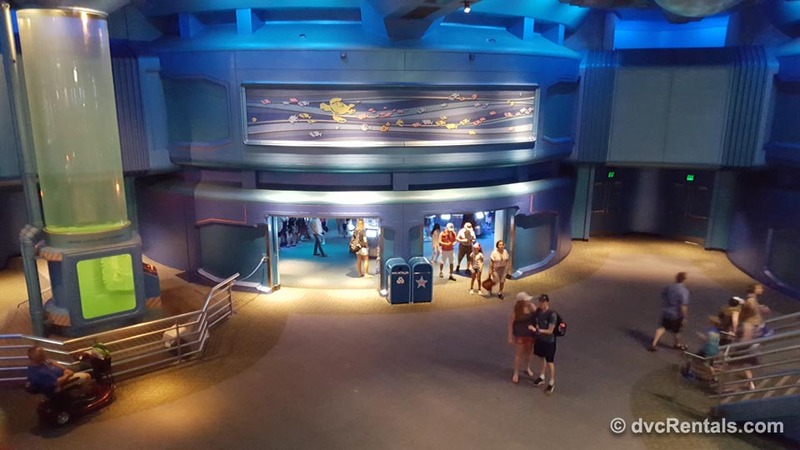 So next time you go on the Nemo ride or have some fun interacting with Crush, I heartily suggest you see all there is to see in the Living Seas pavilion. 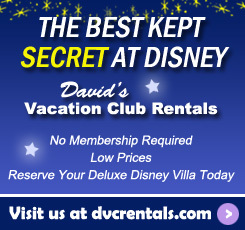 Or skip the line/wait for either attraction, enter the building through the gift shop, and enjoy the multitude of other things found in the pavilion. The Living Seas is one of those places where learning really IS fun, for young and old alike. If you enter through the gift shop, you’ll see mostly ocean-themed souvenirs for sale. Plenty of merchandise inscribed with “Mine Mine Mine”; Little Mermaid memorabilia; Plush Dory, Nemo and Marlin as well as other plush from Finding Nemo and Finding Dory. There are towels, mugs, sand pails with shovels, dolls, clothing, books and more. The selection is not huge, but if you like the ocean there are a number of nice things to choose from. There is also a pressed penny machine in the gift shop, as well as a machine that engraves ID tags (both of these entail a fee). Ok, where to next? For kids of all ages, but especially the smaller ones, look to your left as you come through the gift shop and into the heart of the pavilion. That’s where you will find “Bruce’s Sub House” a room that is actually an indoor interactive playground. There is a huge Bruce the Shark to pose in, making it appear that YOU are his dinner. There are a number of games to play which entail thinking and learning, but it’s so much fun you barely realize how educational it is. 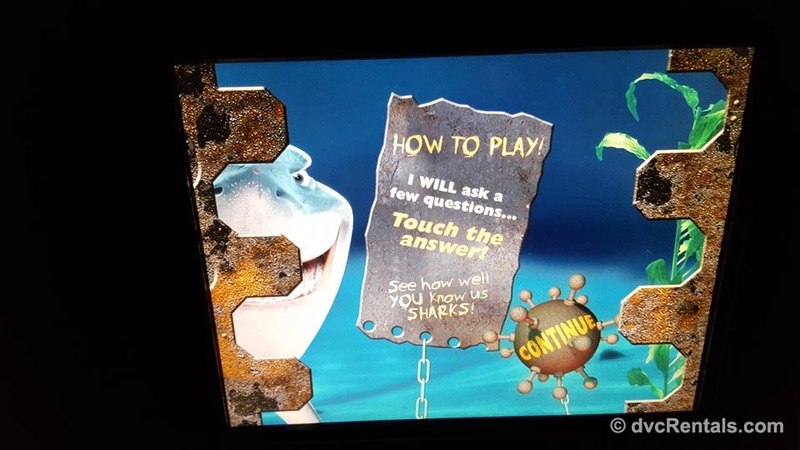 One of my favorite things to do is the “Shark Challenge Game” in which you stand in front of a screen and try to correctly answer questions about sharks. Also on the main floor (yes, there’s a second floor, we will get to that soon), you’ll find diving demonstrations in the Diver lockout chamber (ask a Cast Member the time for the next demo if there is none going on when you arrive), as well as a fairly large room containing many aquariums holding fish that would be too small to see (or who would be eaten!) in the larger tanks found in the pavilion (more on that later as well). 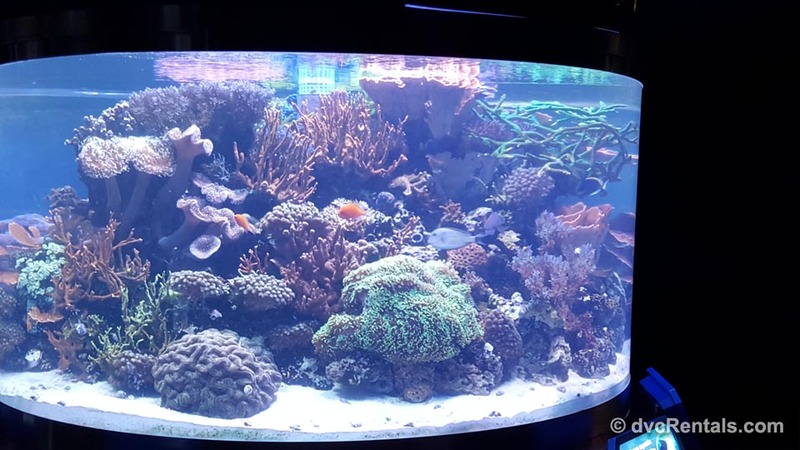 There is a tank with seahorses, one with clownfish (aka Nemo fish), one with angel fish, one with beautiful coral and other tanks with interesting and pretty small fish. 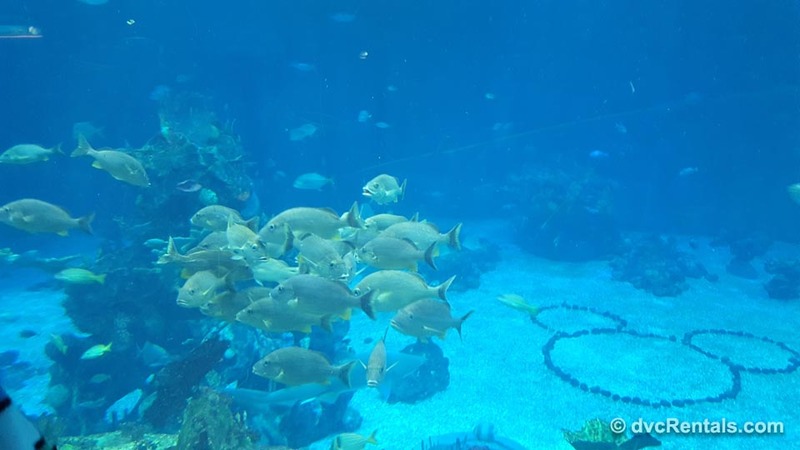 It’s a very relaxing atmosphere, and it’s easy to putter around in there watching the colorful fish for quite a while. 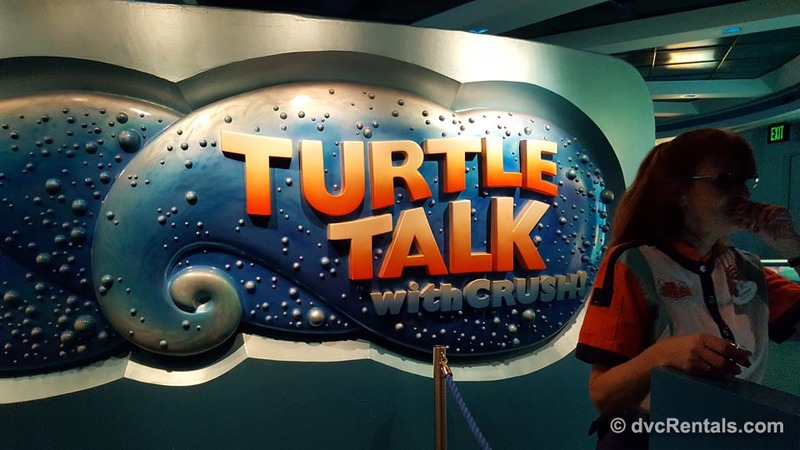 Even though this blog is mainly about things most folks don’t do in the pavilion, I would be remiss if I did not mention that Turtle Talk with Crush is found on the first floor of the Living Seas. (Unlike the ride “The Sea with Nemo and Friends”, which has a separate outside entrance). If you enter through the gift shop, pass through the store and make a right you’ll find the attraction there. Ask the Cast Member if you would like to know when the next show starts. For the uninitiated Turtle Talk is an interactive attraction. Crush the Turtle is seen swimming behind a screen, greets the audience and actually “talks” to individual guests who are given a microphone to speak back. The conversations are spontaneous, and often very funny. Count on hearing many a “Cool Dude!”. Additionally on the first floor, you can see underneath the manatee tank that is located on the second floor of the Living Seas. In the very back of the pavilion on the first floor is something you don’t find inside most pavilions—a bathroom. There is also an elevator there for those who can’t climb the stairs up to the second floor, as well as a pay telephone, another rarity these days. Let’s move on up to the second floor of the Living Seas. I think this is the part that is missed by the most guests, as the Nemo ride lets out on the first floor, so people walk past what I have already written about, and some do stop to check those things out. But a much smaller number seem to make the trip upstairs, although it’s very much worth the effort. As mentioned, if you cannot or don’t want to climb stairs, there is elevator access. Once up there let’s talk about what you’ll find/see. Since I already mentioned manatees earlier, let me elaborate now. 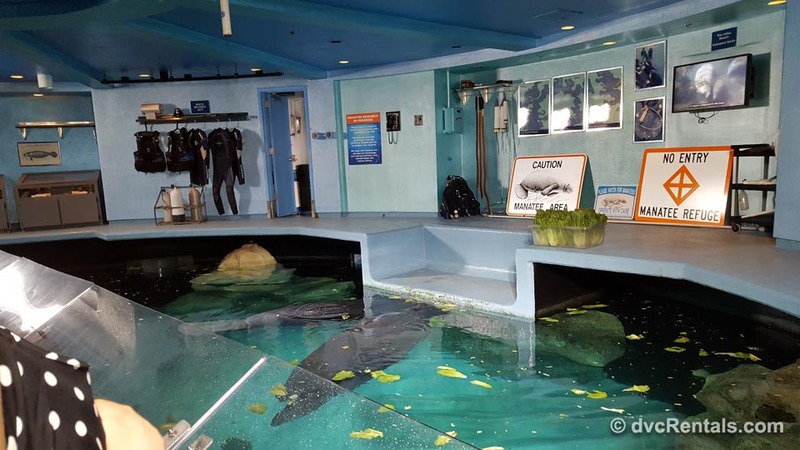 The second floor has an area devoted to manatee education and rehabilitation. The manatees you may have seen from below are much more visible once you go upstairs to their tank. They are manatees that have been orphaned or injured in the wild, and the goal is to get them well enough to be set free again. You can see these gentle herbivores “up close and personal” and if you time it right there will be a Cast Member there to talk about manatees and explain what they do at Walt Disney World to help these creatures. (Again, ask another Cast Member when the next manatee talk will be if you’re interested). Once you can tear yourself away from the manatees there is plenty more to see and do up on the second floor. 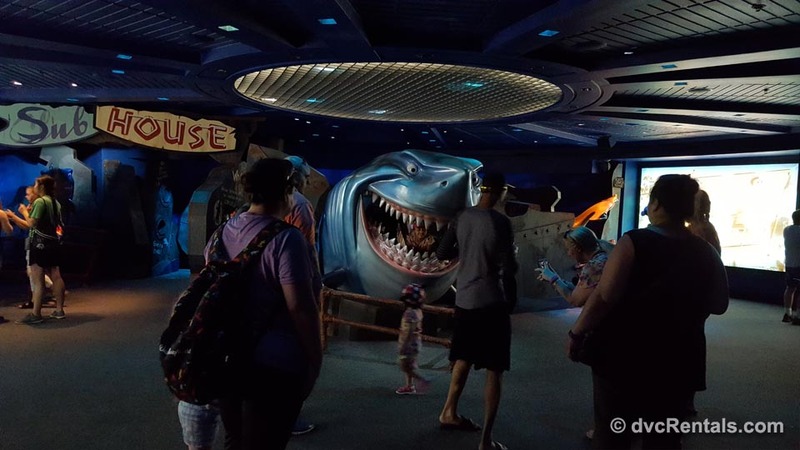 Those of you who have experienced The Seas with Nemo and Friends probably have noticed the large tanks at the end of the ride, the part where you see the gang from Nemo singing Big Blue World and Peach the starfish talking to guests. I don’t know how it works, but the while the Nemo characters are animated, the other fish and sea creatures in the tank are quite real. The tank is huge and extends to the second floor, where there are numerous viewing areas to watch these beautiful animals. There is an additional section upstairs to explore. 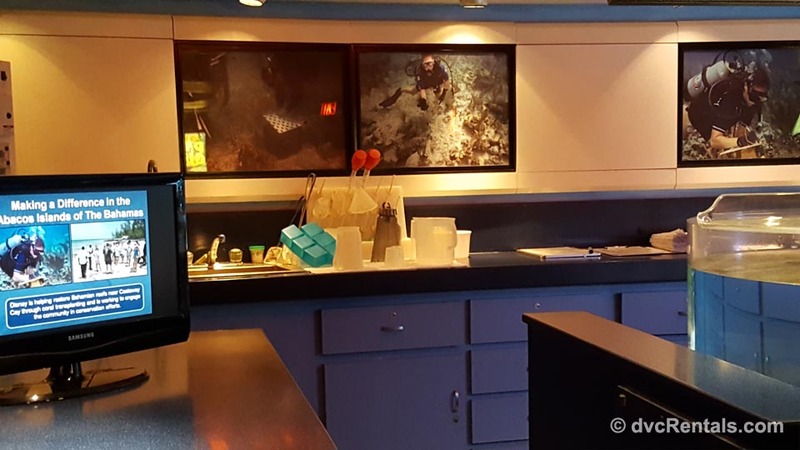 You’ll find a real lab where they do studies and experiments with sea life. There is a really big tank of clownfish up here, considerably larger than the one I mentioned on the first floor. 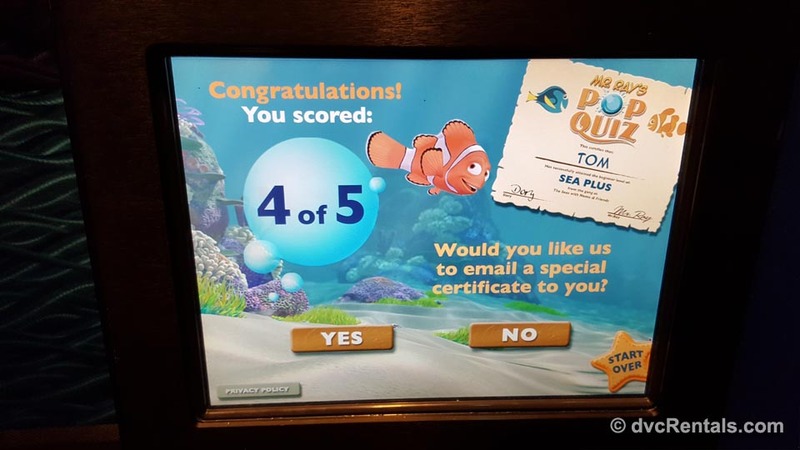 And lastly there is a fun computer game called Mr. Ray’s Pop Quiz, in which you test your knowledge of marine life. You have the choice of easy or hard questions and there is a variety of languages to choose from, making it accessible to most guests. Once you have finished playing (it’s fast, there are not a lot of questions), you have the option to have a cute completion certificate emailed to you. So there you have it! I hope you enjoyed this “tour” of the Living Seas. It truly is a great place to relax, learn and have fun. Next time you’ve got time to spare I hope this blog has inspired you to check out all there is to do and see in the pavilion. And if you’re hungry afterwards, the table service restaurant located right next door, the Coral Reef, has some very good food to satisfy your appetite! 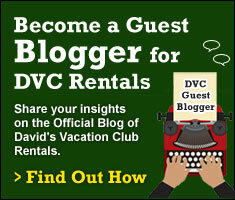 One thought on "What to See at the Living Seas"